Acclaimed theatre director Sally Cookson returns once more to the stage with the fun-filled stage adaptation of popular children’s book, We’re Going on a Bear Hunt. Playing at the West End’s Lyric Theatre throughout the summer, the adventurous story is guaranteed to enchant theatregoers of all ages with its music, colour and thrilling puppetry. Last seen at the Lyric Theatre in 2013, We’re Going on a Bear Hunt is the vivid stage version of Michael Rosen and Helen Oxenbury’s 1989 illustrated novel, which quickly became one of the fastest selling children’s books. Fresh from an international tour, the production brings to life the intrepid family and their musical dog, who are on a quest to find a bear. Journeying through massive swishy grass, to a splishy splashy river, and even thick, oozing mud, the fun-filled extravaganza features catchy songs and interactive scenes that include the whole audience! A hands-on adventure that is packed full of bright colours and eye-catching scenery, expect lots of noise in this acclaimed show. Will they find a bear? 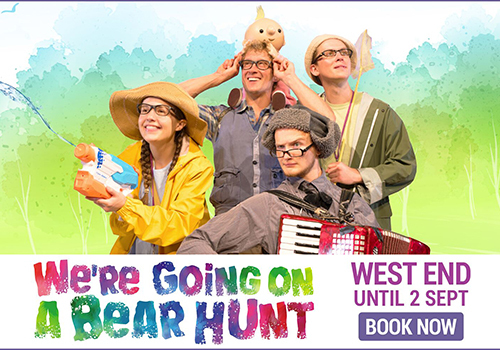 We’re Going on a Bear Hunt is brought to life by four cast members, including Joseph Carey as Dad, Christopher Smart as Boy, Rebecca Newman as Girl and Benjamin Hills as Dog/Musician, with Jordan Turner as Understudy/ASM. The production is directed by Sally Cookson, whose credits include Hetty Feather and Jane Eyre, and features original music and lyrics by Benji Bower. Further creative team includes designer Katie Sykes, lighting designer Tony Simpson and sound designer Jason Barnes, as well as puppet maker Marc Parrett. Playing a limited season at London’s Lyric Theatre over the summer, We’re Going on a Bear Hunt runs from July 4th to September 2nd 2018. We’re Going on a Bear Hunt is suitable for those aged 3 and up. Under 18 months are permitted and do not require a paid ticket, but parents must speak to the box office in the theatre on the day in order to be issued with a baby comp.